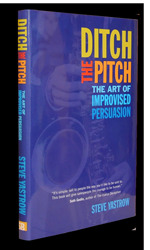 Ditch the Pitch is designed to teach Steve’s approach to fresh, spontaneous, persuasive conversations. Customers don’t want to hear sales pitches, but so many sales people still rely on them. These new skills will show the reader how to identify the details that make each customer unique and how to navigate a conversation that focuses on the right message for the right customer at the right time.